For a while now, TripleO has supported a "DeployArtifacts" interface, aimed at making it easier to deploy modified/additional files on your overcloud, without the overhead of frequently rebuilding images. This started out as a way to enable faster iteration on puppet module development (the puppet modules are by default stored inside the images deployed by TripleO, and generally you'll want to do development in a git checkout on the undercloud node), but it is actually a generic interface that can be used for a variety of deployment time customizations. Lets start with a couple of usage examples, making use of some helper scripts that are maintained in the tripleo-common repo (in future similar helper interfaces may be added to the TripleO CLI/UI but right now this is more targetted at developers and advanced operator usage). Example 1 - Deploy Artifacts "Hello World"
Taking a look inside the environment file the script generated, we can see it's using the DeployArtifactURLs parameter, and passing a single URL (the parameter accepts a list of URLs). This happens to be a swift tempurl, created by the upload-swift-artifacts script but it could be any URL accessible to the overcloud nodes at deployment time. This environment file is automatically generated by the upload-swift-artifacts script, and put into the special ~/.tripleo/environments directory. This directory is read by tripleoclient and any environment files included here are always included automatically (no need for any -e options), but you can also pass a --environment option to upload-swift-artifacts if you prefer some different output location (e.g so it can be explicitly included in your overcloud deploy command). Note the deploy artifact files are written to all roles, currently there is no way to deploy e.g only to Controller nodes. We might consider an enhancement that allows role specific artifact URL parameters in future should folks require it. Hopefully despite the very simple example you can see that this is a very flexible interface - you can deploy a tarball containing anything, e.g even configuration files such as policy.json files to the nodes. Note that you have to be careful though - most service configuration files are managed by puppet, so if you attempt using the deploy artifacts interface to overwrite puppet managed files it will not work - puppet runs after deploy artifacts are created (this is deliberate, as you will see in the next example) so you must use puppet hieradata to influence any configuration managed by puppet. (In the case of policy.json files, there is a puppet module that handles this, but currently TripleO does not use it - this may change in future though). *OH NO* it doesn't work! Use virt-customize or virt-copy-in to copy some modifications into the image, then update the image in glance (this is faster, but it still means you must redeploy the nodes every time and it's easy to lose track of what modifications have been made). Use DeployArtifactUrls to update the puppet modules on the fly during the deployment! First, we clone one or more puppet modules to a local directory - note the name of the repo e.g "puppet-tripleo" does not match the name of the deployed directory (on the nodes it's /etc/puppet/modules/tripleo), so you have to clone it to the "tripleo" directory. The process after we create the tarball is exactly the same - we upload it to swift, get a tempurl, and create a heat environment file which references the location of the tarball. On deployment, the updated puppet modules will be untarred and this always happens before puppet runs, which makes the debug workflow above much faster, nice! The deploy-artifacts SoftwareConfig is deployed inside the per-role "PostDeploy" template, which is where we perform the puppet steps (5 deployment passes which apply puppet in a series of steps). We use the heat depends_on directive to ensure that the DeployArtifacts deployment (ControllerArtifactsDeploy in the case of the Controller role) always runs before any of the puppet steps. 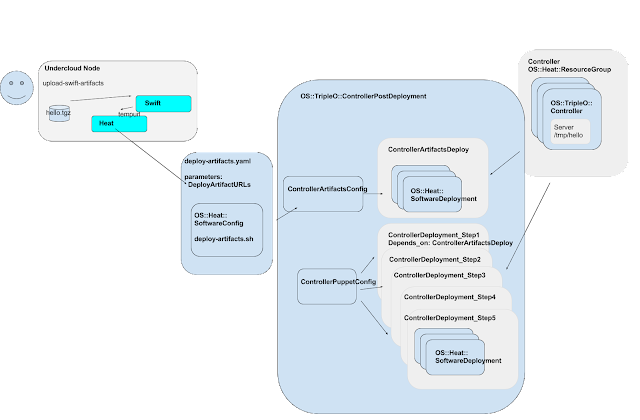 As you can see, there are a few steps to the process, but it's pretty simple and it leverages the exact same Heat SoftwareDeployment patterns we use throughout TripleO to deploy scripts (and apply puppet manifests, etc). Awesomeness here, Steve. I was playing around with this for policy as you alluded to in the article, but great to see the full story, including why you built it in the first place. Using for RPM management will be useful for post-GA Federation work. `openstack stack failures list overcloud --long` is great for getting a full trace too! Salt lamp Most of the time I don’t make comments on websites, but I'd like to say that this article really forced me to do so. Really nice post!